Primary production occurs through a complexpro-cess as shown schematically in Figure 11.1. As illustrated, primary production or algal growth is an ecosystem response to time-variable inputs of natural conditions such as river flows and man-made effects such as pollutant loadings. The primary production or ability of algae to grow is controlled by the availability of light (i.e., solar radiation), residence time and inorganic nutrients and is influenced by ambient water temperature. Additionally, the inputs are affected by the geophysical structure of the water body which influences the advective transport and, in the case of tidal estuaries, the dis-persional transport of the pollutant loads. 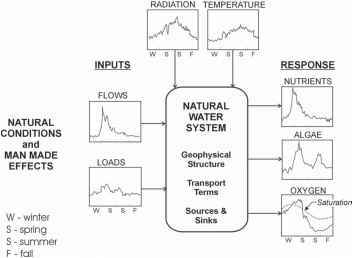 The distribution of materials in the natural system is also affected by various sources and sinks within the water body itself. Figure 11.1. Schematic diagram of primary production: an ecosystem response to natural conditions and anthropogenic effects. above the naturally occurring saturation value in winter byalgalproduction,butmaybesignificantly depressed below saturation in summer if the water column becomes vertically stratified by temperature and salinity. The factors that control the supply of available light and inorganic nutrients are numerous and complex, particularly in a large urban estuarine system such as the Hudson. Factors controlling the availability of light to algae for growth include meteorological conditions such as cloud cover, the turbidity or amount of suspended matter within the water, the density of the algae already present (self-shading effect), and the amount of time the algae spend in the photic zone (i.e., residence time) which is a function of the hydrodynamic properties of the system. Factors controlling the availability of inorganic nutrients to algae for growth include the supply or loads of nutrients from natural and anthropogenic sources, the rates of recycle or conversion of organic nutrient forms to inorganic forms, and the hydrodynamic properties of the system which determine the fraction of the inorganic nutrients in the photic zone. 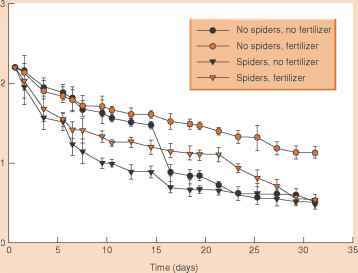 Primary production on a net basis is also controlled by algal loss mechanisms such as respiration and predation. All of the factors or inputs controlling primary production act concurrently and vary over small temporal and spatial scales. Primary production as a response may be measured in two ways, as algal biomass (i.e., by either carbon or chlorophyll-a) or as oxygen (i.e., by the difference between photosynthesis and respiration).